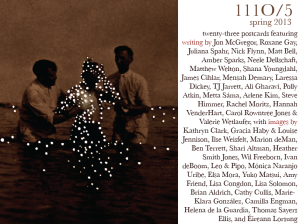 111O is published about twice a year, in spring and fall, and generally contains poems, prose, and photography. You can see the 111O Submittable for guidelines. The idea is to make an object that is both attractive and approachable, and to showcase the work of writers and artists I admire with grace, simplicity, and dignity. That’s why the format of the magazine is small and will stay small: a piece of prose, a photograph, and ten poems (or so: sometimes the form changes a bit). You can read a review of 111O/1 here. The Review Review gave us four out of five stars and called 111O “unobtrusive yet elegant”. Thanks to Jennifer Pearson for her attention to the magazine. A review of 111O/5 is here. Words used include “gorgeous” and “compelling”, and they say that “[t]his little magazine is one to keep an eye on”. Well. Blushing. Thank you, Little Magazine Collection and University of Wisconsin-Madison Special Collections. There’s a review of 111O/6 here. The reviewer says “the issue is of beautiful design with each broadside […] clean-cut and aesthetically pleasing”. Thanks again to The Review Review.